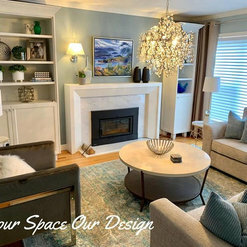 Designer, Charli Junker is the owner of Your Space Our Design, based in St. John's, Newfoundland and Labrador. 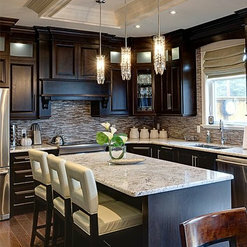 Charli is a regular contributor to Home & Cabin magazine and has appeared on the television show Open House NL. Her work has also appeared in East Coast Living magazine. Charli has worked on over 150 projects, some of which include a Calgary based condo, where she made an average space spectacular in only one week. 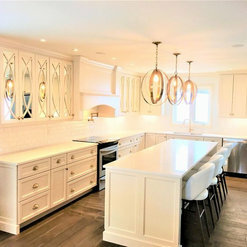 She has also taken a tired 1980’s kitchen and turned into a glamorous masterpiece and worked on countless new home builds from the ground up; as well as numerous renovations and smaller projects. Thank you for your openness to the new ideas Brenda. This truly was a great project to work on. It's a beauty! 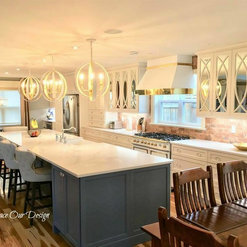 Not only did Charli create a stunning vision for the renovation of our main floor, she was the primary point of coordination from beginning to end. I couldn’t have imagined that such an extensive project would have produced such little stress. Charli remained unflappable and positive whenever those anticipated bumps, which were out of her control, occurred. She always came with the solutions and made sure everything was executed down to the smallest detail. I love my new space. I hate to go out through the door and leave it. It is beautiful, yet functional. It is contemporary, yet cozy. Charli has managed to source the best professionals in their associated fields. I truly had the “Dream Team”. I think It was pretty neat how everything came together with the process. I knew the look I wanted , but had no idea how to achieve it or start . 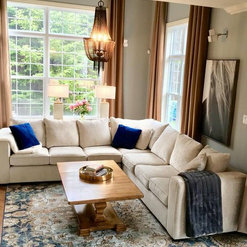 The selections Charli chose, paint colour, light fixtures and furniture items kept things elegant and helped me become creative with my own few touches . I think it’s the perfect balance now of modern/elegant with my own theme and love of the outdoors. Everything turned out exactly the way I wanted . I look forward to working with Charli and her team again in the future . THE ENSUITE BATH & KITCHEN SHOWROOM EMCO CORP.
First of all, we would like to note; there are NOT enough stars on this scale to accurately review Your Space Our Design! Their team of exceptional professionals completely surpass our expectations with each and every interaction. They truly care about their clients and partners in the industry; and it shows. These designs create far more than eye catching aesthetics - they inspire REAL feelings! Whether you want those feeling to be bold, cozy, luxurious, or even relaxed - they have you covered! We have created a fantastic business dynamic and look forward to growing and building together! 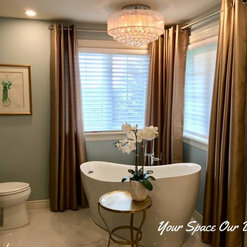 We are so glad that we choose Charli from Your Sapce our Design to do our master bedroom and ensuing design. 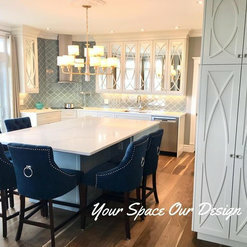 We also choose Charli's team from Kitchen Design Boutique for the ensuite finishes - cabinetry, countertop, tiles, lighting and plumbing fixtures. The rooms are both functional and contemporary, just as we wanted. We like that they spent some time understanding our style and from there selected several choices of products and price ranges from which we could choose. The entire team is very responsive to any questions and concerns and we are extremely pleased with the level of professionalism, service and value. We highly recommend Charli and her team! We first hired Charli after admiring her work on social media. We had a brand new house but decided to redesign a poorly laid out kitchen, dark master bedroom and drab main living area. 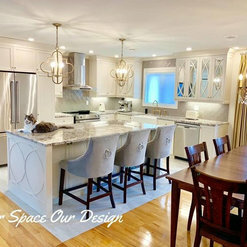 Charli's eye for design and exceptional customer service translated into a stunning new and very functional kitchen with all the elements we had on our wish list. Our master bedroom is a beautiful haven and the main living area is now an area we are happy to spend time in. What stood out most for us was her willingness to be readily available when we had questions or concerns during the process and always kept us cool. Her response time is second to none! 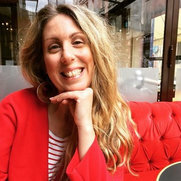 Some designers see their vision as the only vision for a clients' home but Charli is so flexible and always manages to keep her clients' visions and wishes in her design plans. I'm excited to do more projects with Charli and her team! Last year I hired Charli Junker to do a total makeover of my bedroom . She did an absolutely amazing job . She was very easy to work with and always available to answer any questions. We were thrilled with the finished product .I also had Charli pick out a new paint colour for the exterior of our home and we love the new look . I would definitely recommend Charli if you are looking to do any redecorating or remodelling. Charli helped renovate our two children's bedrooms. She listened to our initial thoughts and ideas on the spaces and helped us piece it all together. My daughters room required all new furniture and Charli advised us on every single piece. We wanted her room to be furnished modernly but also be functional for a young child. We are so pleased with the result! In my sons room she used the existing furniture but added in all the finishing touches to make it a cozy space. He loves it! Both rooms turned out beautifully! 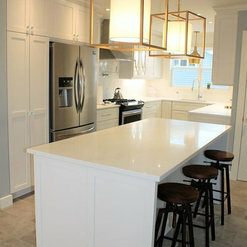 Charli has been the key to our successful renovation, she has given us the timeless kitchen , great room , master bedroom and ensuite we wanted. Her experience and knowledge is quite evident in the finished project. 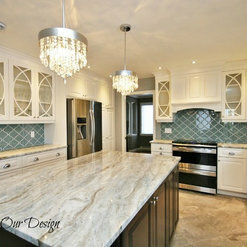 We couldn't be happier with our inviting,elegant , functional and gorgeous home. Thanks Charli ! Working with Charli was a fabulous experience. Her creativity, patience and positivity transformed my home into a comfortable, relaxing, elegant yet rustic retreat. We went with an eclectic look with some shabby chic. I wanted the look but had a hard time making decisions. Funny, because I wanted the changes but found the change challenging. Charlie was so patient with me and I quickly learned to let go and let her work her magic. Charli is very skilled at managing projects and only recommends contractors that she trusts. 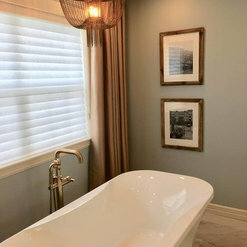 This was quite helpful as these contractors were reliable and highly skilled (Zen Painting and Architectural Finishes, Property Projects electrician). Charlie has her finger on the pulse of what's new and beautiful and is so skilled at seeing the big picture. I fell in love with the 3D plan she devised and living in it as the finished product has been a gift. The process took a while and I was easily overwhelmed. I really appreciated that she would send me only a few options to choose from at a time, such as with lightning, furniture, and drapery. My favourite experiences were seeing things fall into place from lighting, to drapery, to furniture to paint. It was hard for me to picture at first but Charli had it all under control and knew it would be perfect. But the best part was when Charli and her colleague, Josh, did the finishing touches at the end of the project. I was like a child when I walked into the finished house, squealing with joy as I went from room to room looking at the perfectly chosen and placed artwork and accessories. I finally feel like my home is complete and cannot than Charli enough. 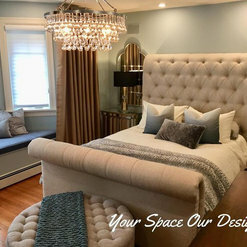 I definitely recommend Your Space Our Design and wouldn't work with anyone else. Charli Junker is the best, hands down. Commented: Love the room and layout. Do you know how wide the room is (length ofThis room is about 15 ft wide. Commented: I lvoe this tub. Can you share what brand it is? Thanks!It's from Maax. the Reverie.